This professional stereo turntable features a high-torque direct-drive motor for quick start-ups and a selectable internal stereo phono pre-amplifier that allows the turntable to plug directly to computers and other components with no dedicated turntable input. Other features include: forward and reverse play capability; cast aluminum platter with slip mat and a start/stop button with remote start/stop input; three speeds 33/45/78; selectable high-accuracy quartz-controlled pitch lock and pitch change slider control with +/-10% or +/-20% adjustment ranges; and removable hinged dust cover. A replaceable Audio-Technica ATP-2 cartridge is included. Prices includes domestic freight delivery within the lower 48 states. Rediscover your classic 33-1/3 and 45 RPM records on this affordable, fully automatic belt-drive workhorse. With its built-in switchable phono preamp, the AT-PL50 may be connected directly to your computer, home stereo and to other components that have no dedicated turntable input. 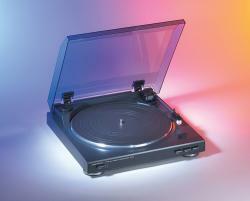 The turntable is supplied with an integral Audio-Technica Dual Magnet™ phono cartridge with replaceable ATN3600L stylus. Prices do not include freight. Add $9.00 for delivery within the lower 48 states. Audio-Technica brings its legendary quality and audio fidelity to the digital realm with the creation of the new LP-to-Digital Recording System. 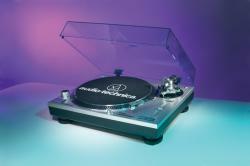 In the box, you’ll find everything you need to transfer your classic LPs to digital files: Audio-Technica’s AT-PL50 stereo turntable, complete with built-in switchable phono preamp that allows direct connection to your computer; Cakewalk PYRO software; the AT6012 record care kit; an audiophile-quality phono cartridge; and an adapter cable. The system is perfect for creating CDs and MP3 player files that get your old tunes off the shelf and into your portable player. We stock more styli than any other dealer in the Western United States!